For four days last week, I was immersed in an extraordinary community created by the Parliament of the World’s Religions: almost 10,000 people converged on Salt Lake City from around the world to learn about each other, pray for peace, and talk about saving the planet. The week was rich and dense with intercultural experiences. At dawn, I stood in a sacred circle with Ute people around a fire of wood and sage, gazing up at the Wasatch mountains beyond the highrises. I reclined on pillows with women in a conference room transformed into a red tent. And I learned a traditional Maori greeting from Grandmother Rose (Dr. Rangimarie Turuki Arikirangi Rose Pere), who came all the way from New Zealand to speak truth to power about corporate greed and climate change. I heard inspiring speakers including Jane Goodall, Maryanne Williamson, Madea Benjamin, Joan Brown Campbell, Tariq Ramadan, Chief Arvol Lookinghorse, and Allan Boesak. And, I delighted in the inscrutable pop-up happenings that make the Parliament so much more lively and radically inclusive than an academic conference: the folks dressed in light-up angel wings, the young men in clown costumes dancing under a disco ball suspended on a long stick. The Parliament includes the sublime, and the ridiculous. Christian writer G. K. Chesterton gave it the snarky epithet: “a pantheon for pantheists.” But more accurately, it is an encounter of pantheists, monotheists, atheists, and everyone else. 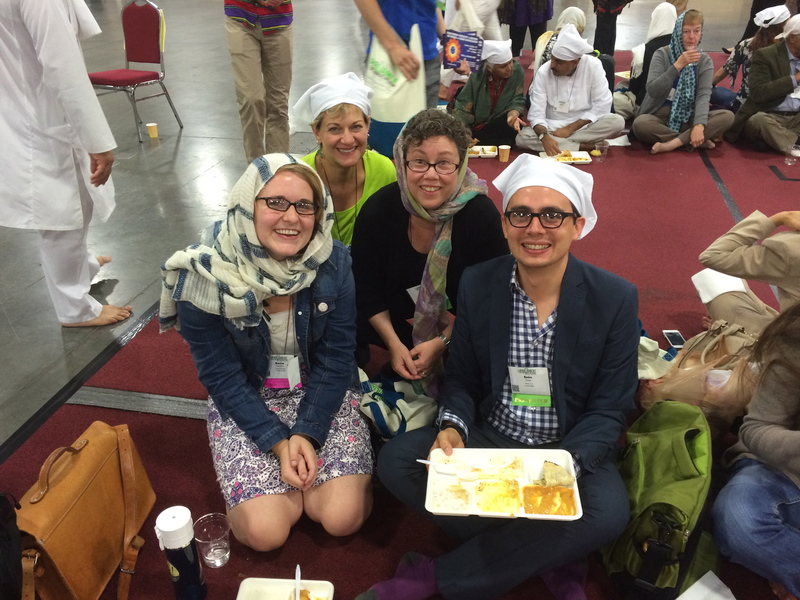 One of the highlights of the Parliament for me occurred each day, when I took off my shoes, covered my head with my scarf, and enjoyed a free vegetarian meal served by the Sikh community in an extraordinary act of community service called langar, designed to uphold the principle of equality of all people. 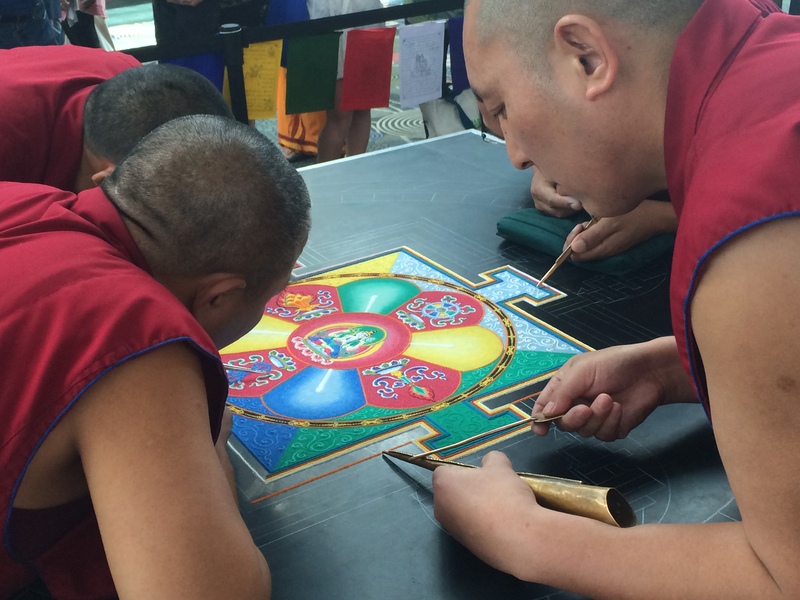 Whether sitting cross-legged on the floor at langar, or standing and watching the Tibetan Buddhist monks make a sand mandala, I got to meet people I never would have met otherwise, because at Parliament, everyone talks to everyone else in a spirit of openness. I also got to hang out with longtime friends who converged from my interfaith word (including emma’s revolution, Melody Fox Ahmed, Jackie Fuller, Katie Gordon, Victor Grezes, Katherine Rand, Sean Rose). And I finally met interfaith twitter buddies I had never met in person, including Vickie Garlock, Tahil Sharma, Simran Jeet Singh, Ellie Anders). Each Parliament is different, marked by time and place. 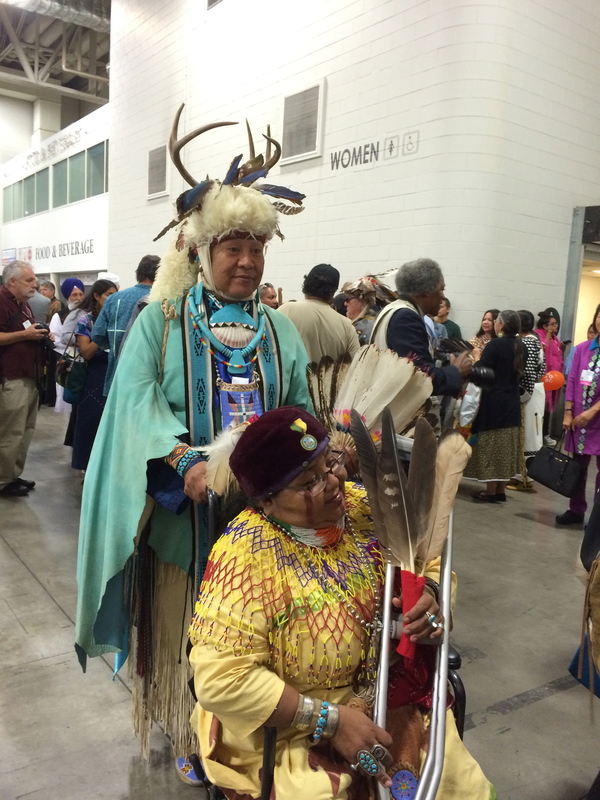 Because we were in the Great Basin, this Parliament provided a strong opportunity to engage with indigenous American religious traditions from throughout the West and Canada. It also, of course, provided an opportunity to experience the center of the Mormon world. 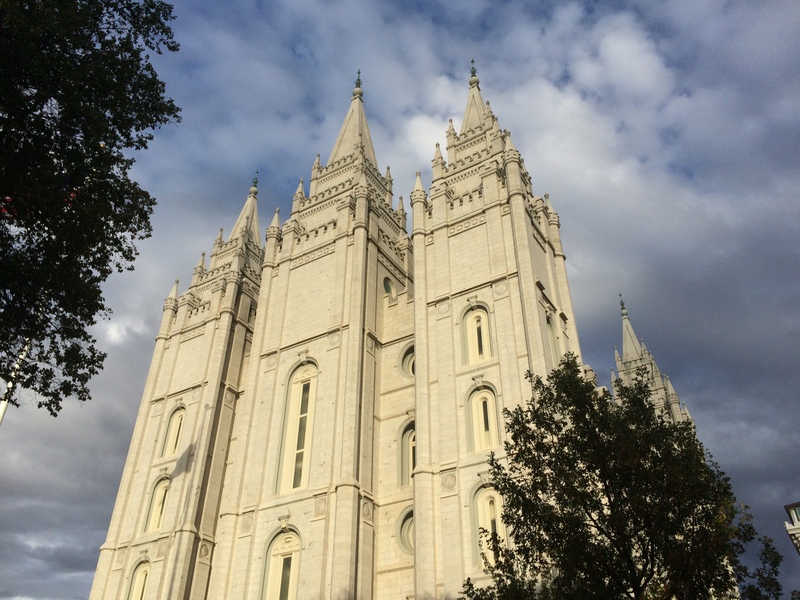 On my last day, suffering conference burnout, I stumbled out of the Salt Palace and walked up to Temple Square. There, I entered the 19th-century Assembly Hall and chatted with a young woman on her mission with the Church of Jesus Christ of the Latter-day Saints (the LDS Church) as she explained her faith. 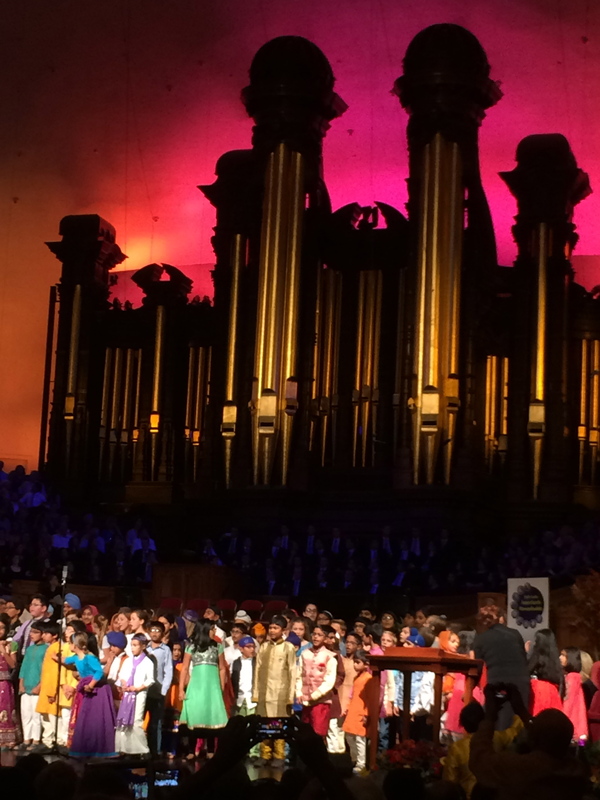 Then, I headed into the spectacular Mormon Tabernacle to witness music and dance from a dozen different religious traditions on Sacred Music night. Judaism, my primary religion, was represented by a group of rabbis positioned all through the Tabernacle who blew long shofars together at the invocation, and by a multi-faith choir of local children who led thousands of people in singing a Shlomo Carlebach nigun (a mystical wordless tune). You never really know when or where you will have a Parliament experience again. So far, only a handful have been held (Chicago 1893, Chicago 1993, Cape Town 1999, Barcelona 2004, and Melbourne 2009). Parliament organizers announced their intention to hold the next one in two years, although we don’t yet know where. Wherever it is, whenever it is, I don’t intend to miss it. Susan Katz Miller’s book, Being Both: Embracing Two Religions in One Interfaith Family is available now in hardcover, paperback and eBook from Beacon Press.